This PDF 1.4 document has been generated by Writer / OpenOffice 4.1.0, and has been sent on pdf-archive.com on 15/09/2016 at 08:37, from IP address 71.222.x.x. The current document download page has been viewed 2462 times. File size: 137 KB (23 pages). 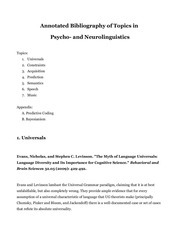 Brain Sciences 32.05 (2009): 429-492.
that refute its absolute universality. even if only a single case, there may be many more such exceptions not yet discovered. new rules will certainly be invented in the future. With this reality in mind, the authors address the perennial questions of linguistics. Faculty.&quot;Behavioral and Brain Sciences 32.05 (2009): 465-466. UG. 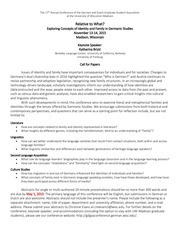 Furthermore, language acquisition requires shared, genetically endowed learning ability. that Evans and Levinson rely upon for their arguments. semantic content of phrases and sentences are further chunked at higher levels of abstraction. Each representational level has its own bottleneck, hence the need for chunking at every level. small parts of the language model, not the entire model. in the short-term result in language evolution in the long-term. Memory.&quot; Behavioral and Brain Sciences 24.1 (2001): 138-39.
intrinsic to the human brain. quotes and paraphrasing because of the highly concise, encyclopedia-like nature of the chapter. based operation to add -ed, rather it is learned by analogy to other similar words. emerges from generalizations that children form. chunking and its constraints as this phenomenon is extremely well supported. being formed after implicit learning of statistical relationships. The other is that SL is a byproduct of effective chunking; Competitive Chunking and PARSER may be viable models. 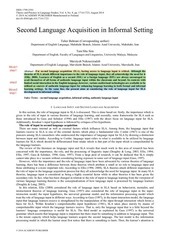 Current Directions in Psychological Science 12.4 (2003): 110-14.
multiple levels, from categorization of speech sounds to word and grammar learning. input” that aid in acquisition. This file has been shared by a user of PDF Archive. Document ID: 00483366.